A plan to double the size of the Swedish Medical Center’s Cherry Hill campus is headed to the City Council for a vote next week. The expansion, first proposed in 2011, has drawn sharp criticism from neighbors who object to the height and bulk of the project. A proposal to double the size of Swedish Medical Center’s Cherry Hill campus cleared a major hurdle Tuesday, despite nearly four years of opposition from some neighbors. 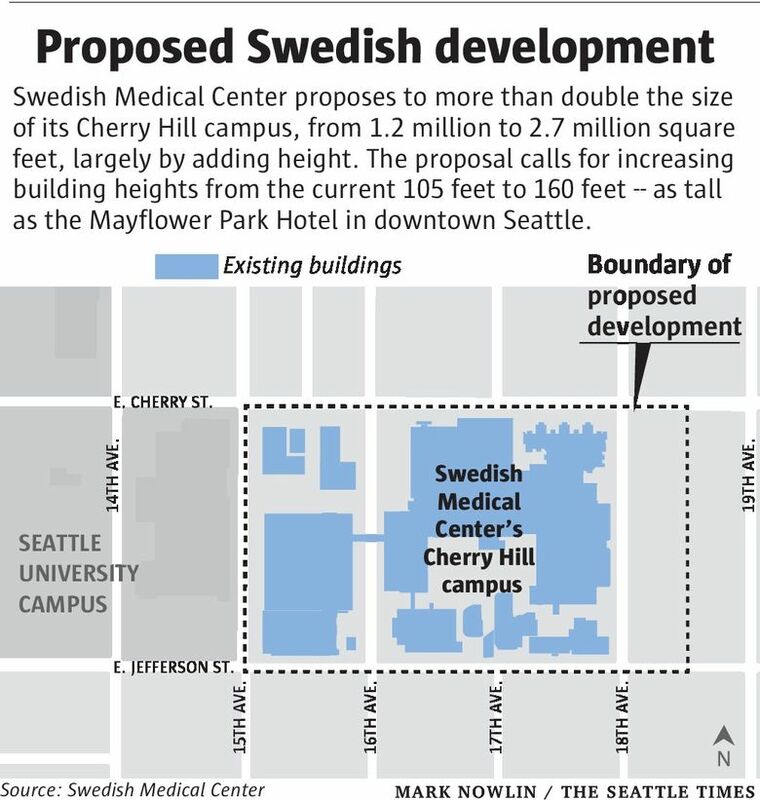 A Seattle City Council committee voted to recommend that the full council approve Swedish’s plan to increase the size of the medical center from 1.2 million square feet to 2.7 million square feet to house expanded medical, research, hotel and support space. A final council vote is scheduled for Monday. Swedish officials said the expansion is necessary to accommodate growth at the medical center for the next 30 years. The Cherry Hill campus serves about 380,000 patients a year now, a number expected to increase by up to 50 percent over the next three decades. “We are at capacity. We are trying to project a campus that meets the needs for the future,” said Andy Cosentino, vice president of the Swedish Neuroscience Institute and Rehabilitation & Performance Medicine. The Planning, Land Use and Zoning Committee agreed Tuesday to shave some of the height of the project to respond to neighbors’ concerns about the height and bulk of the expansion. Councilmember Lisa Herbold suggested reducing the height of the western block of the project from 160 feet and 150 feet to 125 feet. Overall, it would reduce the size of the expansion by about 6 percent. “I believe this strikes a balance,” Herbold said. The proposal calls for raising the height from the current 105 feet to 160 feet in the campus interior. For comparison, that’s as tall as the Hilton Garden Inn and Mayflower Park Hotel in downtown Seattle. 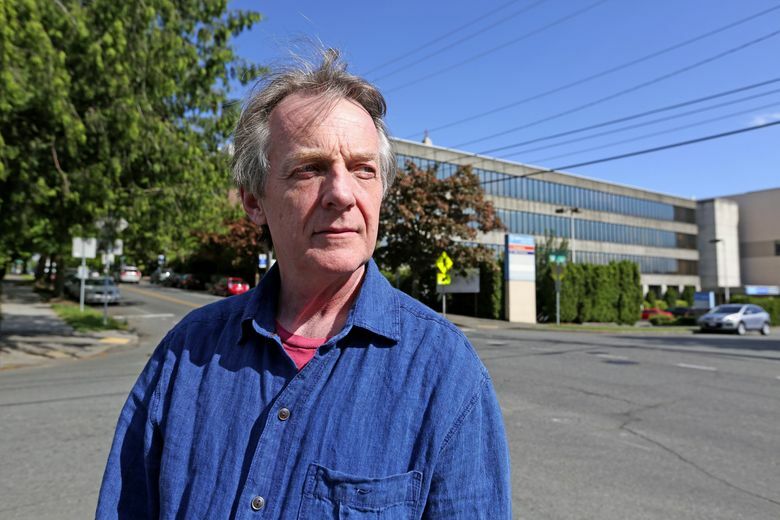 Neighbors such as Dean Paton, who has lived on 16th Avenue for nearly 25 years, have protested the size of the project, which was first proposed in 2011. “I think the height, bulk and scale of the campus is still too big and it will still put a strain on the surrounding neighborhood,” he said after Tuesday’s vote. Swedish officials said the project will allow the center to expand its brain and spinal-care program, which includes state-of-the-art treatment and rehabilitation for traumatic spine injuries. It also allows a gradual increase in the number of beds from 225 to 385, which the hospital is already approved for under its state certificate of need. ‘’Part of this is that we need to grow into our certificate of need,” Cosentino said. The Cherry Hill campus, the site of the former Providence Hospital, is east of the Seattle University campus in the Squire Park neighborhood. Single-family homes are to the south and east of the site. The area north of the site is zoned for low-rise multifamily housing. The campus stretches from East Cherry to East Jefferson streets, 15th Avenue on the west to 18th Avenue on the east, as well as the western half of the block between 18th and 19th avenues. Sixty percent of the campus is owned by Swedish Health Services. The rest is owned by Tukwila-based Sabey, a data-center company to which Swedish sold property it now leases back. The original expansion proposal was revised a dozen times, mostly at the behest of a citizens-advisory group that met three dozen times starting in 2012. “I think that overall, the entire process has been frustrating on everybody’s part,” said Dylan Glosecki, 33, who has lived on 19th Avenue since 2012. Nevertheless, Glosecki said he’s among neighbors who think the amended project should move forward. One key issue has been traffic generated by Swedish, which has a single-occupancy vehicle rate of 57 percent. Swedish will have to reduce that to 32 percent by the time the buildout is complete, council committee members agreed. That will be a tough goal, Cosentino said. Swedish has about 1,300 employees, and that number could grow by about 1,000 with the expansion. Swedish plans to survey employees about commute habits this month, then begin several efforts to reduce traffic, he said. “We need to prove that we’re making substantial progress before we pursue a building permit and well before we put a shovel to dirt,” Cosentino said. He pointed to a poll last year conducted by an independent firm that surveyed more than 600 Seattle residents, including 200 in the Squire Park neighborhood. The poll found that 75 percent of respondents supported the expansion, including about 63 percent of those in Squire Park, he said. Thirteen percent were strongly opposed. But Paton said that during more than three dozen community meetings, all of which allowed public testimony, the sentiment was solidly against the scope of the expansion.